Jigsaws are an indispensable home improvement tool. One of the best saws in the market today is the DeWalt DC330K Heavy Duty 18 Volt Ni-Cad Cordless Top Handle Jig Saw. If you are looking for a tool that can go a long way then this is definitely a great pick. In this review, we will be taking a closer look at the DC330K Heavy Duty Jig Saw. If you are interested in getting it for yourself, please read on. 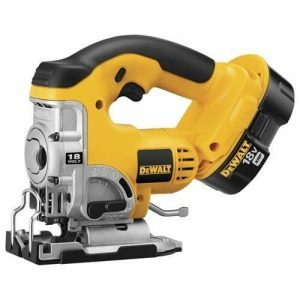 If you look at the images on this page, you will see that the Dewalt DC330K Jig Saw is fairly small. The cordless feature also makes the saw handier to use. You can work as far away from a socket as you want without having to worry about positioning. It is easy to maneuver, and users have found that they can easily make intricate designs and use the saw without being confined by the amount of space they have to work with. The cordless jig saw design also allows users free movement, no more worrying about cords wrapping around table legs or tripping you over. At just over 12 lbs, this is a very lightweight top-handle heavy duty Saw. What does that mean for the average user? It means that the saw is easy to transport from one job site to another. It also makes handling the saw much less tiring. The lighter weight makes it easier to move through the wood without exerting too much effort. This Dewalt Saw features an all-metal shoe. This makes it possible to use the saw with a number of different materials without worrying about how it is going to stand up to the abuse. It also helps make the shoe last longer for better and longer lasting jig saw use. Pre-marked detents at 15, 30, 45, and 0 degrees are also found. This helps guide users in making precision bevel edges, that way if you do not have a miter saw, you can rely on this cordless saw to do bevel cuts for you. The saw can go up to 3,000 SPM, but you will be able to adjust this speed depending on what type of material you are working with. The dust blower also helps to keep the work-line clean of dust and chips, which aids in making precise cuts. This Jig Saw Kit may only come with just one battery but has an XRP extended battery life. It allows for longer use and a prolonged batty life. The batteries also charge to full in one hour. The saw’s top handle has also been designed with a no-slip grip. This adds to safety and helps users hold on to the saw better, even if they have sweaty hands. P.S. The battery also makes its body longer which makes it harder in tight corners. “I love the jigsaw , but it requires a lamp to illuminate the cutting space i.e. greater visibility around the work area” Would love it if there was an accessory to address this. One complaint is the blade does not readily drop when the release lever is pulled. You will have to pull it out manually. For most users, this is not that big of a concern as many would rather have it this way than have to deal with the trouble of blades that fall out mid-use. The saw only accepts T-Shank Jigsaw blades. With rave reviews from practically anyone who has gotten their hands on this saw, it is definitely something we feel confident recommending. If you do not do a lot of miter and bevel work then you should opt for the Dewalt DC330K. It is an all-around saw, plus it does have those angle detents that can help guide a clean cut. If you are interested in a miter saw, you can read our reviews on these meters from Dewalt, Bosch, and Makita.